Occupational therapy is one of the healthcare services in McKinney, Texas that patients recovering or aging at home can benefit from. It is intended to help people of all ages live more independently and productively through the therapeutic use of daily activities. 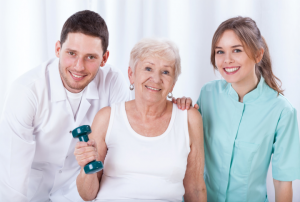 Home health patients can benefit occupational therapy in many ways. For optimal health and wellness, aging people must make the most out of their ability to take part in essential and meaningful activities. An occupational therapist facilitates their abilities to adjust to their daily activities in order to promote optimum wellness. They teach techniques on conserving energy while doing daily activities like bathing, dressing and preparing meals. Also, he evaluates the impact of low vision and offers ways to guarantee the patient’s safety. The therapist looks at every aspect of the patient’s situation and makes necessary recommendations. A lot of older adults prefer to age in place because of the familiar environment. As we age, our needs change; however, our home stays the same. But, because of a disease or disability, a home may need some modifications to ensure the safety of the person living in it. An occupational therapist evaluates the needs of his patient like adding grabbing bars or handrails in the bathroom and determines hazards such as overloaded electrical outlets. The therapist is expert at determining the type of modifications needed to better accommodate the changing needs or the patient. Assistive devices are designed to improve or maintain a disabled person’s functional capabilities. They range from simple ones like sock aid to more complex ones like a product system or technological device. Depending upon the patient’s needs, the occupational therapist may recommend assistive devices to help him in his daily life. For instance, he can recommend a table that has a built-in camera that the patient can use for enlarging recipes and labels when trying to prepare his meals. Also, a reacher can be used by the patient to easily pick up light objects from the floor. Older people who are living alone and those living with a disability find it frightening to experience a fall. Falls cause injuries, especially in seniors. Occupational therapy is performed by a skilled therapist who assesses and addresses both the persona and his environment for hazards and limitations which are likely to contribute to falls. 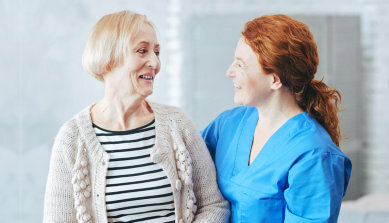 With an occupational therapist’s help, a home health patient can have confidence in doing daily activities safely necessary to stay independent and avoid self-limiting behaviors that could cause the person to perform fewer activities. April is Occupational Therapy Month and to celebrate this, don’t deprive yourself of the benefits of this service. It can be your best option to stay active independent despite your age, limitations or disability. Just pick up your phone and dial 214-351-3360 to talk to a Dover Healthcare Services LLC consultant.